Here we are with yet another post on our favorite Pi. We had many different posts on Raspberry Pi as well as on GSM-GPRS connectivity. So what do we have here new? What we discussed so far focused either on GSM connectivity or TCP/IP connection over GPRS, here we intend to tether our Raspberry Pi to the internet through a GPRS cellular data connection. Lets see how its done..
Make the connections as shown in the figure above. Provide separate power source (5V 1A) to the GSM modem for proper functioning as it drives much current. Insert a 2G activated SIM card, with working data connection, and power up the modules. It will take a few seconds for the SIM to get registered to the network. 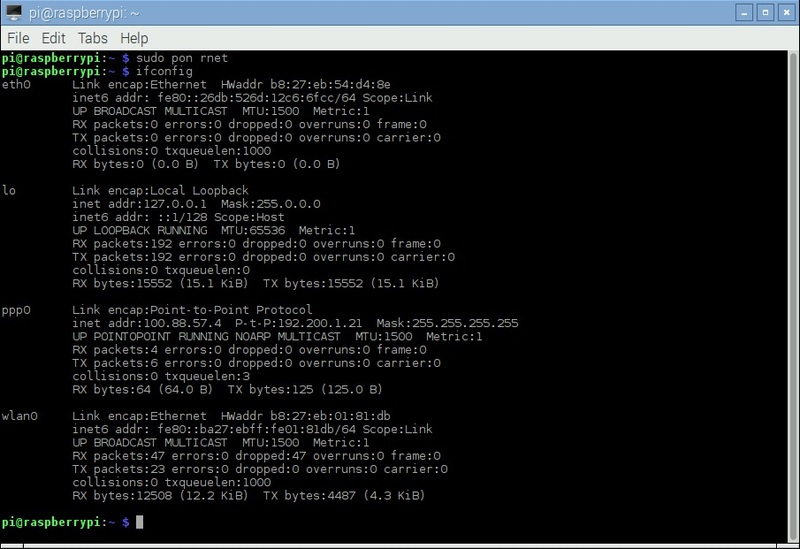 Now we need to check the communication between the RPi and the modem. For which, we make use of a python code that transmits an AT command and verifies whether an OK is received as acknowledgement. 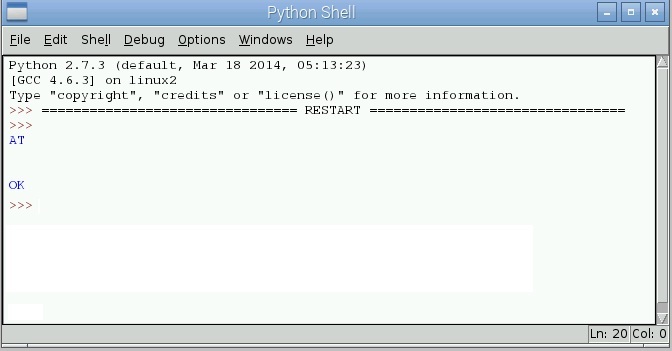 Open a python shell using sudo idle command and create a new file. Copy the code shown below, save and run the code. 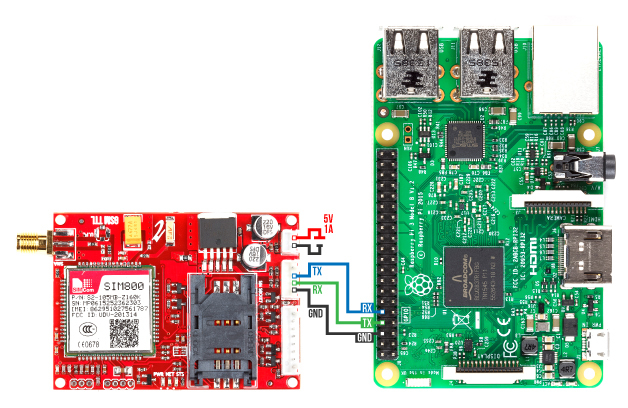 If you are new to Raspberry Pi, we suggest reading this post before you proceed. Run the code and if the connections are all working good, then we will receive an OK acknowledgement in the python shell. PPP or Point to Point Protocol establishes a Node to Node communication using serial interface. We make use of this, while accessing serial data connection on a PC. Here, using the serial connection, proper commands and PPP, we are about to access the internet on Pi. Copy the code shown below to the new file. connect "/usr/sbin/chat -v -f /etc/chatscripts/gprs -T imis/internet"
From the above file, two parameters must be changed which depends on the modules used. In the beginning command, connect, after the section -T, the APN of the service provider should be given. Here we have used the APN of Idea (imis/internet). Then comes the communication port, as we have used Pi 3 in our exapmle , the port name is /dev/ttyS0. Save the configuration file by pressing ctrl+x. This configuration file controls the options that will be set by PPPD, when the GSM Modem PPP connection is created. You can find a description of all the options in the PPPD main page. This will open a new file, which is not needed to be edited and this explains how a GPRS connection is created. If the SIM card needs a PIN to unlock, un comment the line AT+CPIN=1234 and set the pin instead of 1234. Save the file and exit. Next is to establish the connection. Before that make sure, all the steps described above are executed with no errors and proper wiring connections are also made. 127 Responses to "Raspberry Pi : How to access the Internet using GSM / GPRS Modem (SIM900/SIM800)"
will this work on raspberry pi other than raspberry pi 3? are you sure? will this work on raspberry pi b+? Thank you! It works fine. You saved me a lot of time! can we attach files , like for eg, images and send such datas, through this procedure? Anybody help me to resolve this error please..
What should be my next step then? Hope you had updated the OS and make install all the modules mentioned…. Will we be able to receive phone calls after establishing this connection? Is there any way that we can use USB modem for internet and also receive calls? Using this module we can Get the calls..
We need a ttl to USB converter for connecting the modem to Raspberry Pi. After entering ‘cat /var/log/syslog | grep pppd‘ Igot following comments “bash: syntax error near unexpected token `newline’”. Nov 25 23:06:47 raspberrypi pppd: Exit. Nov 25 23:08:55 raspberrypi pppd: Exit. Please help me. How to solve this problem?? your power is low please connect your gsm module with 1A mobile charger. I the above tutorial is done in RPi3. Hope u are using RPi3, follow the instructions as described in the tutorial. Check if changing the baud rate to 9600 solves the problem in rnet. It solved for me. Apr 10 17:34:47 raspberrypi pppd: Exit. I am too getting this error. Please provide support to troubleshoot this issue. Please install the latest Raspbian OS and enable the serial port dev/ttyS0. I have a doubt regarding GPRS communication of RPi3 using SIM900. 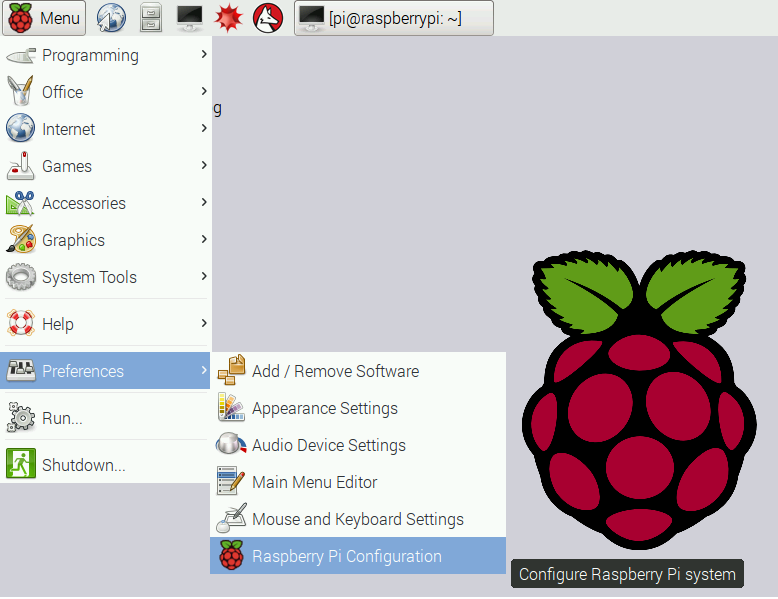 I install the raspbian latest software in my RPi, What are the configurations setup is required for the same.Please give me a step by step instruction for a successful communication. This tutorial is based on Raspberry Pi 3. Hope you are using the previous version , then intead of ttyS0, ttyAMA0 will be the device. So I guess I am asking what I'm not getting right cause some times it prints some messages that should show at login prompt but this time they are incomplete. e.g login:__ ,inux Raspbian, etc more like a leakage. As you have the ttyS0 port, follow the same instructions in the tutorial..
if you want to check your modem just refer the link given below. I can connect the internet to raspberry pi through GSM module and I want to transfer that internet connectivity to my smartphone via wifi by using ESP8266 module so that I can access internet to my smartphone. If you are working with Raspberry Pi 3, it could be possible to make it as a wifi router. I am using RPI 3 and did all the steps as given, but still I am not able to access internet. What could be the issue? Hope you had provide separate power for GSM module and shortened its ground to the Rpi as shown in the figure. Also the sim that you had used in the modem, must have internet activated. Thanks for the the input. I found the issue, problem was with default route was not getting replaced from wlan0 to ppp interface. Do I have to repeat the above steps on each restart of RPi3? Or I have to do it only once and it will automatically create a PPP connection on each restart. Only this command ‘sudo pon rnet’ should be given for making the ppp connection and no need to do all the process for each restart. I used the pi3-disable-bt overlay after a dist upgrade. This gives me /dev/ttyAMA0. It fails on getting an answer for “AT”. So scaled down to 9600 bauds and sure enough, things worked better. Now it fails at AT+CGDCONT, but that’s for another day. As you are using RPi3, it would be better to use dev/ttyS0. I am using ‘http://www.amescon.com/products/pilot.aspx’ board for my RPi3.I have managed to make ppp internet connection successfully, but I would also like to check for any SMS’s being received, when I try to access my ttyP0 using a serial terminal (picocom in my case) I get a message ‘FATAL: cannot open /dev/ttyP0: Device or resource busy’. I understand why I am getting this message as the devices is reserverd and used for the ppp connection. Is there a way to also check or send SMS’s? The only option is to stop the PPP connection and then send the sms. this can be done through Python program itself. thank you for your tutorial, I want use SIM800C on OpenWrt ,is it possible???? This tutorial is also applicable for SIM800c. It’s possible to get GPS coordinates when PPP is active? It will be good to use a GPS usb dongle for getting the GPS co-ordinates as there is only one uart for Raspberry Pi. First, thanks for this great tutorial. I’ve got this working with a RPi3. Trying to do the same with RPi0w. I’ve changed the com port /dev/AMA0 but when I view the syslog, I only get “Connect script failed”. Any suggestions? We are not dealing with Rpi0. Any how we will look in to it and update you. Hope you had made the proper connections as shown in the diagram, like providing extra power source for GSM modem with common ground to all. also make sure the connections to Tx and Rx pins are correct. HI, I recently bought a PI3 and SIM900 module from you and i tried to follow the above instructions. I have however an issue. When I disable the serial then the device /dev/ttyS0 is also gone so the script no longer can be followed. Do i need to manually enable ttyS0 one way or another to make this work? I also used ttyAMA0 when i disbaled serial but then I get for example a “6″ as a response to the AT command and not ther expected “OK”. In that change the parameter enable_uart=1. then save the file and make a restart. Looked it up in the internet and apparently has to do with some change in pi3. Do i need to encode this and if yes how? I have gone a bit further but not there yet. I get now a response back but it is like /x00/x00…. All squares. Can you help with fixing this? Sir,can we use this method for sending and receiving data on internet into raspberry pi. 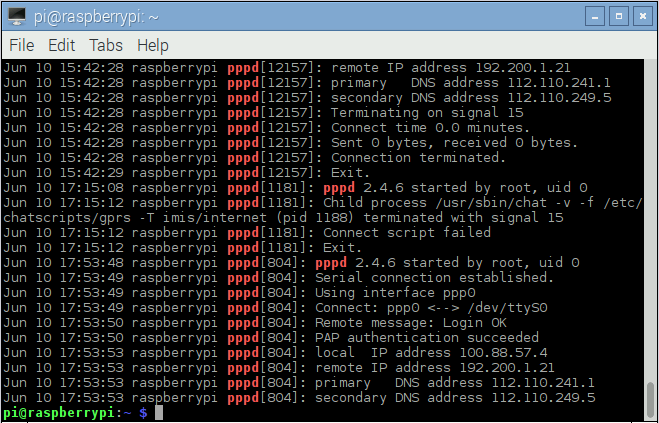 Yes,we use this method for sending and receiving data on internet into raspberry pi. Since the string is not always the same i cannot use it in a program. How can the sim900 module always return something else? is it possible to open up a hotspot? I followed the steps and can successfully connect to the internet via sim800h fona. Now i want to open up a hotspot. I’m using a wireless usb adapter which is capable to open a hotspot. I can’t find something in the internet. Any suggestions? Thank you for your information. I have established a ppp connection, now am able to access internet. But my problem is whenever am trying to send SMS, an error is occurring. From that error i got that the serial port is busy with the accessing internet. Here one way to send SMS is i have to stop the internet connection whenever i want to send SMS, but i don’t want to do this. Is there any way to send SMS without disconnecting internet?. Can i connect to any other serial port to send SMS? ( using Raspberry pi 3). Actually, I want to use this GSM module (SIM900A) to send SMS, Making call and accessing internet. Is there any possibility to do this?. Can i use UART (For call and SMS) and USB (To access internet) ports at a time on SIM900a?. If it is, can i use this (https://www.elementzonline.com/cp2102-usb-to-serial-rs232-module-with-usb-cable-106) converter. It would be grateful, If you help me in this. RPi has got only one TX and Rx pins. With one GSM modem you can perform only one process. How can i ON and OFF the ppp connection automatically? and whenever i OFF and ON the connection again, How can i automatically check the ppp connection is established successfully and am accessing the internet without any problem? You can write a python code to run the terminal commands using ‘call’ function. What ports should I use if I am working on raspberry pi2? Will this tutorial work for pi2? Also, does it work for a 3G or 4G sim? To make it work with 3G and 4G sim, you have use another type of modem. Hi! I am using https://www.mikroe.com/gsm-2-click with raspberry pi 3 and doing the same connections as mentioned but I am getting blank response. Any clue what could the issue be? Hi. Thank you for this post. I am getting this error in python shell.What am I doing wrong ? your Raspberry Pi’s UART port is not enabled. type sudo nano /boot/config.txt in the terminal. if the command already exixt with enable_uart=0, make it as 1. Fantastic tutorial.Thank you. Can you see why I cannot connect to the internet ? Please install the latest Raspbian OS and follow the same process. Hope you are using Raspbeery Pi 3. In the Pi3 only the port /dev/ttys0 will be recognized. 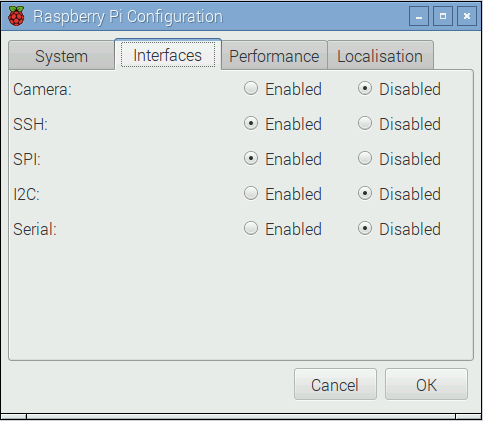 But after the raspbian installation, make the enable_uart=1 in the config file, as intially it will be 0. Then reboot the system and follow the same procedure. I need code for the same using Arduino i.e how to access internet using sim900a and send data to a webpage. I also wanted to know how to receive response from webpage. My project is with the latitude and longitude coordinates I get from the GPS I need to know the name of the location. I completely only till getting GPS coordinates. Can I use a sim808 module for also get the GPS location?? The deal is configure the so for a new modem connection but still sending at commands to get the location info. By using two modem you can operate this process, but one modem should be connected via USB as the Rpi has got only one UART. If I connect this module shall I re-enable the serial port. Because I need to work on both this module and serial port. So is it possible ? Please try to perform serial communication via USB…. So you can either connect the Arduino via USB port and GSM through UART Pins…. i need help. i used your coding to check whether my AT reply OK . but it does not reply anyting . Hope you had provide proper connections and separate power source to the GSM modem. May i know what should i do if i need to add in username and password for my APN ? When i run ‘cat /var/log/syslog | grep pppd’ command after ‘sudo pon rnet’ it shows “Binary file (standart input) matchees” that’s it no log. Please install the latest raspbian OS. The Raspberry pi is already updated, and i’m checking the S0 port connection with the same above python code but i’m getting an (OK) it just execute it without printing anything and without showing an error, is this normal ? And i’m still getting the same error (Connect script failed). In the peers folder there is the PPP login name which is by default (user “myusername@realm”), do i need to change anything here ? And also do i need to modify anything in the (options) file in the (ppp) folder ? Sorry there was a typo, i wanted to say i’m not getting an (OK), when i execute the python script the result is blank, it does not show any reply or an error. Thank you for your help! Hope you had made the proper connections. Also you must provide separate power for GSM module and the ground pins(power source, Raspberry pi and the gsm modem) must be shorted. The module i’m using has only one UART serial port (ttyAMA0) and it is occupied by the GPS, and running (sudo minicom /dev/ttyAMA0) i can see the GPS data coming from there. In this case is it possible to create a PPP connection also through the same UART port ? or i should use a (software serial) if it is possible with Raspberry ? or if there is any other way ? I’m sorry for the many questions. Thank you for your help!! Software UART is not possible in Raspberry Pi. And at the same time you cant access both PPP connection and the GPS data from the same UART. so you need to provide a switching condition in your code for getting these properties. Kindly do you have a code sample on this idea ? to put a break between the connection of the GPS and the GSM. So i can first connect with GPS for 15 seconds and save the data and then disconnect from the GPS and make the connection with the GSM SIM also for 15 seconds and send the data. And then this code will be looped over and over again. Hi! Thank you for the great tutorial! Finally i can see ppp0 in ifconfig with IP, but if i disable my wlan connection i can’t get acces to internet. what should i do? Hope you had provided a simcard with proper internet connection…. I have used this method to send data to database. But it automatically after some time stop uploading data to the database and gsm modem needs to reset. After reset it again starts uploading data. How can I solve this problem so that I don’t have to reset again and again. As You are using 3G sim, that modem will be only provided with 2G speed. So i thing, there must arise any hanging issues while updating the database. My suggestion is to decrease the speed rate of uploading the data. I am using 3g module and 3g sim but getting 2g speed. Thank you so much, very easy to follow, worked at the first try. Is it supported 800c gsm /gprs quad band TTL UART modem ? is it necessary for individual power supply?.. or if we givfe a power source from raspberry pi gpio pins..?? Providing individual power supply is the safe option. other wise some power fluctuation will make the module to restart. how can we connect a txd,rxd,gnd , vcc in gsm800 c with individual power supply and rasberry pi gpio pin? Two wires from the ground pin of the power supply should be taken, one connected to the ground pin of RPi and another one to the sim800c module.